Throwback Thursday – Disney Style! 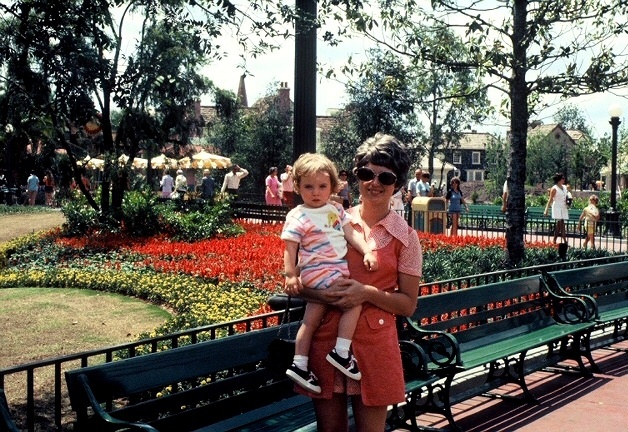 My mom & I in Magic Kingdom a long time ago! Here’s a little “Throwback Thursday” Disney Style for your enjoyment today! Back on October 1, 1971, Magic Kingdom at Walt Disney World in Florida opened with only 26 attractions. They were Jungle Cruise, Swiss Family Treehouse, Sunshine Pavilion (now Enchanted Tiki Birds), Cinderella’s Golden Carrousel (now Prince Charming Regal Carrousel), Dumbo The Flying Elephant, Mad Tea Party, Mickey Mouse Revue, Mr. Toad’s Wild Ride, “it’s a small world”, Snow White’s Adventures, Diamond Horseshoe Revue, Frontier Shooting Gallery, Country Bear Jamboree, Mike Fink Keel Boats, Hall of Presidents, Haunted Mansion, Main Street Horseless Carriage, Jitney, Fire Truck, Horse-Drawn Streetcar, Omnibus, Main Street Cinema, Walt Disney World Railroad, Skyway, Tomorrowland Speedway and 20,000 Leagues Under the Sea. The general admission cost was $3.50 for an adult, $2.50 for a junior (ages 12 to 17) and $1.50 for a child (ages 3 to 11). Your general admission ticket only got you in the park though. Back in those days, you had to buy tickets for the individual attractions. That is where the expression “E-Ticket” came from, for all of you young people out there! For around $4.00, you could purchase a 7 Adventure Book that gave you one A, one B, one C, two D and two E tickets. It is amazing how much Walt Disney World has evolved through the years! Headed to Florida to See Today’s Disney World? Do you remember Disney World from long ago? Please leave a comment! We remember back then and having a Magic time watching our daughter having such amazing fun. No one knew at the time that those early experiences would plant seeds that would begin a lifetime of fun for us and Her family today. Looking forward to seeing some more “E” rides on our next trip and keeping up the traditions for Generations to come.